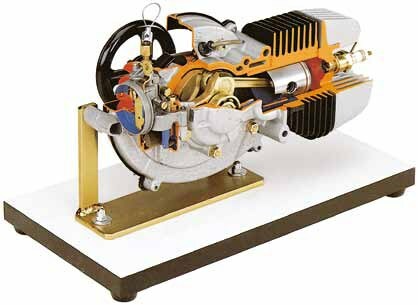 Accurate section of a real 2-stroke engine, cut in every detail, carburettor, ignition, etc. The suction-exhaust-transfer channels are especially highlighted so as to make it easy to learn the cycle. This cutaway model is carefully sectioned for training purposes, professionally painted with different colours to better differentiate the various parts, cross-sections, lubricating circuits, fuel system, cooling system etc. Many parts have been chromium-plated and galvanised for a longer life.